Reading progress update: I've read 60 out of 271 pages. so, I decided to get going on this after knocking off only one Stephen King short story, as it became just too tempting. I think I’d rather be reading a snowy, freezing scenario in a novel when real-life conditions don’t mirror those in the book. if it’s January, for example, and there’s two feet of snow outside, and pools of wet and slush at the corner of each intersection, and the wind has dropped the temperature an extra ten degrees, and I get home feeling like I have a cold coming on while simultaneously realizing that I forgot to buy a lottery ticket and the draw is tonight and so have to go out again...I think, when I finally get back and get settled in, I want a murder taking place in Tahiti, or somewhere near one of the Egyptian pyramids, in my fiction, as opposed to snow, snowiness, snowed-in people with snow snowing snowingly down. and no ice, please. some of you lot are the opposite: “deep winter means give me a winter Mystery...died skiing in an avalanche, avalanche likely caused by one of the shady characters snowed in at the lodge, maybe even the Santa Claus lookalike who lost two fingers due to frostbite as a child, and the power just went out and a snowy owl just crashed through the window while freezing to death...PERFECT for Boxing Day Reading!!!”. no, not for me, give me A Caribbean Mystery, and an antihistamine please. so yeah, since I rarely pick books to sync up with actual, maybe extreme, weather conditions, but am either reading too randomly for that to happen or, if anything, looking for weather opposites (“get me the hell away from here, book!”), I don’t care about saving this Mystery for winter. the seance premise overrides the weather and enivironmental conditions presented. as for how things are going after 60 pages: well, there’s a lot of dialogue without much internal thoughts and feelings being revealed - characters’ idiosyncrasies and personalty traits - even their pasts, backstories - are coming through, but coming through via conversation...including conversations where two people are discussing someone else. and there’s no “Great Detective” to take up a lot of paragraphs being fleshed out as odd, brilliant, and thoughtful. so, it moves fast, and the pieces are filled in through what people say, and the thing they do next. it reads kind of like a Freeman Wills Crofts novel, except that I don’t know if Crofts would get things going with a seance. 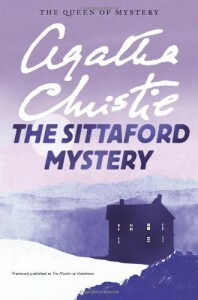 my comments hopefully are not suggesting I’m disliking it - just that it feels different than a Poirot book. the seance, people contacting the spirits of the dead for a lark and being told someone (a long way) down the road is freshly dead - moidered, even - gives me my Halloween read, especially when...okay, yes, it’s deep winter out there for these characters, and Christie does well making sure you know and get extra shivers from the fictional frostiness, but she’s not preoccupied with endless descriptions of the whitened environment. we’re not trapped in a freezing wilderness or anything - but when people have to trudge around outside...well, hello winter. the book is not particularly descriptive in its approach, is what I mean; IMO, she’s not ramping up the mood with long, wordy paragraphs that make the conditions dominate the book (“a little Mystery with my Winter, please, if it’s not too much trouble...?”), but rather, she has effortlessly and succinctly put the weather and daunting environment in place, and it remains to be seen how much weather, or snowfall, or travel times lengthened by trudging everywhere, or trains delayed or cancelled by severe conditions, or whatever, has anything actually to do with the murder or its solution. as I say, for me this is a creepy, effective Halloween choice, because we don’t have incriminating footprints out in some snowdrift somewhere (yet)..but we do have a seance where the supposed spirits of dead people mentioned, via thumps, that a murder was taking place right then and not far away. I rest my case for fitting this one in “early”, with the ghosts and goblins. added thought: very creepy that the Stephen King story I just read had characters named Duke and Pearson in it...and so does this Murder Mystery. may be the most unsettling thing about this book so far.